Quite possibly the most sustainable music festival in the world, Pickathon strives to leave Pedarvis Farm as it was found. The almost-80-acre area is in fact mostly comprised of natural spaces, as hiking trails extend for miles past the main stages and festival locales. As such, Pickathon has taken even more steps this year to stay clean. By keeping the attendance numbers down (there were only around 7,000 guests, artists and volunteers in total this year), the festival organizers were able to communicate its strict eco-friendly policies and enforce them efficiently. The most impressive green scheme at Pickathon is the elimination of plastic single-use items. All of the locally sourced food vendors serve their deliciousness on plates and bowls made of durable bamboo, with utensils of the same material. Drink stands distributed beer and spirits brewed/distilled in Oregon in stainless steel pint cups with the Pickathon beaver logo etched on the side, thanks to a partnership with Klean Kanteen. These efforts, in conjunction with the omnipresent recycling and composting bins, help get rid of 25% of the waste generated by each person at Pickathon. Additionally, much of Pickathon is run by solar energy. Three portable solar-powered generators are brought in for the fest itself, which power more than 3.5 miles of trail lights and serve as a cell phone charging station for guests throughout the weekend. Pendarvis Farm has also placed permanent solar panels on the roof of the Galaxy Barn; the energy generated during the year offsets 100% of the energy used on that stage, plus 100% of the electricity used by the food and craft vendors. 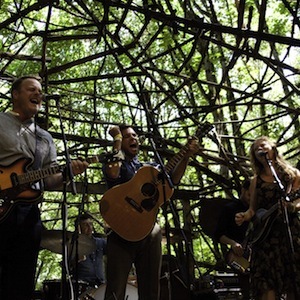 The last day of Pickathon had a certain calm to it. Even through the Oregon heat and dusty air, the fans seemed unencumbered; the artists played graciously and emotionally. Paste saw a number of new festival-favorites like the hip, jazzy Lake Street Dive and doo-wop-inspired Lady, as well as repeat performances by The Lone Bellow and Shakey Graves. Of course, headliner Feist dominated Sunday, as her graceful presence and fringed cape-like shawl swept across the extra-illuminated Mt. View Stage. By 4 a.m., most fans had either left the festival grounds or retreated to their tents in the woods. And by Monday afternoon, Pendarvis Farm would return to some state of normalcy. As the sign says: Leave no trace. Special thanks to the folks at GuildWorks for their assistance in arranging the aerial photo.